My feline friend Mr. Kat crossed the Rainbow Bridge Friday night, after a relatively short – and noble – fight with cancer. He died relatively peacefully at our sides, on his favorite spot on the bed at the age of 12, battered by rounds of chemo and with one missing eye which had been removed in a last ditch attempt to somehow preserve his remaining quality of life. Our family did everything we could do to diagnose his condition, find the right treatment and ultimately keep him out of pain. After all, he was our “first baby” who we found – when he was less than four weeks old – on vacation in the most remote place in Brazil. When we found him we nursed him with goat milk through a straw to save him from the brink of newborn kitten death and invited him into our home even though at first I was allergic to cats. Over the next twelve years he served as the center of our household, bringing us many laughs, snuggles, antics, adventures, and cat hugs not only to our immediate family but to all of our friends and neighbors. He moved houses several times and even countries which brought him more adventures and frequent flier miles than most people. More than anything Mr. Kat was a friend who taught me some key life lessons that I think can be applicable to many, even if you are not a “Cat Person.” Ironically, when I first found Mr. Kat I wasn’t a cat person either. Mr. Kat was dealt a raw hand to start. He was left for garbage at the foot of a bar before he was weaned from his Mother. Luckily, we stumbled upon him on vacation on New Year’s Day in 2001, snuck him into our hotel, nursed him back to health and brought him into our family. Mr. Kat, in fact, spent three weeks traveling with us on vacation as we toured the remotest places of Northeast Brasil. Once his condition stabilized on vacation with us, he discovered fish, papaya, and other great foods which quickly helped him get stronger. We brought him to the beach, protected him from the occasional monkey that threatened him and wrapped him up every day in a towel to give him the milk he so needed to get stronger and stronger. After this tough start, Mr. Kat did not look back. He integrated quickly into our home in the Southeast of Brazil and became friends with everyone who met him. With the help of our friends, we adopted another cat (Midnight) who stayed at his side until the very end. Even a fall from the fifth floor from our apartment building did not stop Mr. Kat. Luckily, our housekeeper was caring and persistent enough to know that something was wrong when the usually friendly Mr. Kat did not greet her at the door. She found him curled up at the bottom of the building, and in the makings of a small town movie, she sprinted to our trusted Vet to save his life. Luckily, Mr. Kat emerged from this traumatic fall with only a broken jaw. He went on to move with us to Chicago, live in three different homes and easily made friends everywhere he went. As Mr. Kat was recuperating from his fall and Midnight was dealing with a bout of pneumonia, they had a litter together. I never imagined how quickly this could or would happen especially with two super young and sick cats! I learned my lesson which is why I now passionately support the Spay and Neuter movement and several great organizations committed to helping unwanted pets find homes. 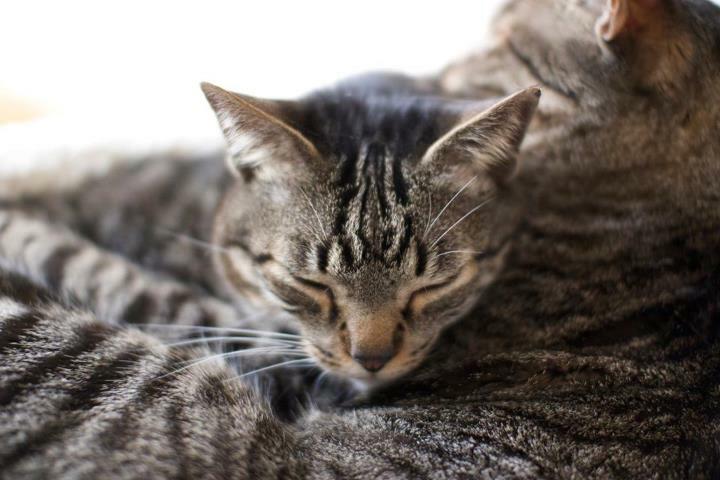 Mr. Kat loved his cat family, taking care of his cat children and Midnight, always snuggling them tight in a cat pile. He was affectionate around my children – even though he didn’t really get who they were when they first came home as newborns. Mr. Kat quickly set the tone – that this home welcomes all – and he quickly became the friend of most who came to visit. Mr. Kat, unlike many people, knew what happiness meant to him. He appreciated a snuggle, a cat nap at the window no matter whether it was rainy or shining outside and exploring. He loved his “Cat Condo” (my Husband ordered it on the Internet…think about a place in Palm Beach for Cats, only in the backyard!) He also was a fan of late night TV and relished a snuggle together with our kids or us in our respective beds. He loved to play games, cherished cat nip and of course the occasionally-served tuna fish. This week my daughter read to her class for the first time from a book she wrote. On one page she said, “My cat, Mr. Kat, is sick. He has one eye and he needs medicine. I love my cat. He makes me happy.” I welled up as she read that. Two days later Mr. Kat passed. He passed away after giving “carinho” (kisses and hugs) to Midnight and his children. He died giving his last breath to Daniel and I. He will be missed and always will be loved.